The resin finish highlights the carving perfectly and the crafts people who make them by hand manage to characterise the owl form exactly. Mango hardwood is used which is extremely workable and harvested for use in ornamental furniture at the end of its useful fruit bearing life. By reclaiming the wood local crafts people are helping to reduce deforestation elsewhere and gaining a regular income at the same time. The presence of spalting in the mango wood gives a two tone effect that looks great. The feathers are depicted simply but realistically and the use paint to highlight the eyes and beak is a lovely ornamental feature. The carving around the rim of the table top sets it apart from the rest of the design. 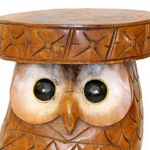 Overall our Owl Table has a artistic hand-made appeal that’s difficult to resist. Due to the hand crafted, individual nature of our ornamental furniture the exact details may vary from piece to piece. A really handsome creature, very heavy, superb quality table, very pleased with my purchase, packaged very well & arrived very quickly. Thank you. This was advertised and featured in one of the national newspapers, i purchased and it was delivered 2 days later, i have it in my summer room, what a great feature, totally unique, it gets a lot of attention.